The DJI Osmo Pocket Gimbal is a lightweight gimbal stabilizer and 4K camera combination that is compact enough to carry wherever you go. Weighing just 116g and measuring only 121.9mm high, this all-in-one unit features 3-axis mechanical stabilization to smooth out your movements. The DJI Osmo Pocket incorporates a 1/2.3" sensor and a wide f/2.0, 80° angle-of-view lens to record up to 4K60 cinematic video and 12MP still photos on up to a 256GB microSD card. Unlike a similarly sized smartphone, the candy bar-sized DJI Osmo Pocket offers intelligent functions like Active Track, FaceTrack, and Motionlapse to create compelling, creative effects. Choose between 180° and 3 x 3 panoramic shots to capture wide landscape vistas. The FPV mode provides a selfie perspective, and NightShot can be used to capture moonlit or low-light scenes. 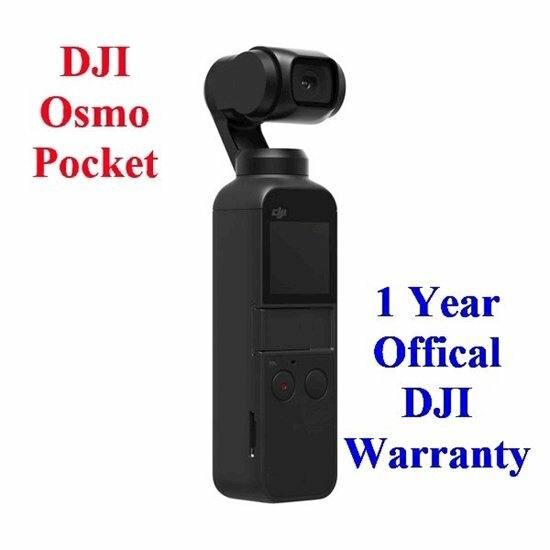 The DJI Osmo Pocket's passive cooling system quietly dissipates heat, and a rechargeable battery enables the camera to record up to 140 minutes of 1080p video. Accessories like ND filters, a retractable extension stick, a waterproof case, and an accessory mount are available separately to round out your DJI Osmo Pocket experience. Note: The optional Bluetooth Module is required for Bluetooth and Wi-Fi connectivity.